With over 300 certified CAM’s around the world a new bar is being raised for business aviation leaders to bring more to the table that will integrate the operation and management of business aviation into the strategic goals of the company. Recently I had a conversation with Sheryl Barden, President & CEO of Aviation Personnel International, about the CAM certification program and she relayed to me that she thinks it is a “really great step for the business aviation industry.” Sheryl went on to say that “by receiving your CAM certification it shows that you are dedicated to your profession and that you are a self-starter.” I walked away from the conversation renewed in my belief that a designated CAM is a person in our industry that is curious about his/her profession and wants to see the bigger picture. There is something to say for an individual that strives for continuous improvement and wants to continue to grow. The CAM certification program is a great goal for anyone serving in the business aviation function. 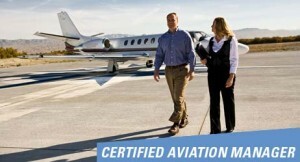 To learn more about becoming a Certified Aviation Manager click on the web address below for more information, or call me directly at 918.230.1449. This entry was posted in Admin Ops, Flight Ops, General and tagged CAM, Certified Aviation Manager, Leadership, NBAA. Bookmark the permalink.